Why Do Cats Eat Cat Grass? Cats like to have a cheeky chew on some grass for a couple of reasons. It's rich in folic acid, which helps your cat increase their blood oxygen levels. It's high in fibre, which helps your cat clear their digestive tract of hair or other unwanted materials, either through bowel movements or vomiting. Where can I get cat grass? You can purchase a mature grass plant or you can grow your own! Most nurseries sell ready to chew grass, but be conscious of the plant pot it comes in. Enthusiastic cats can tip over pots, spreading soil all over your living room rug! 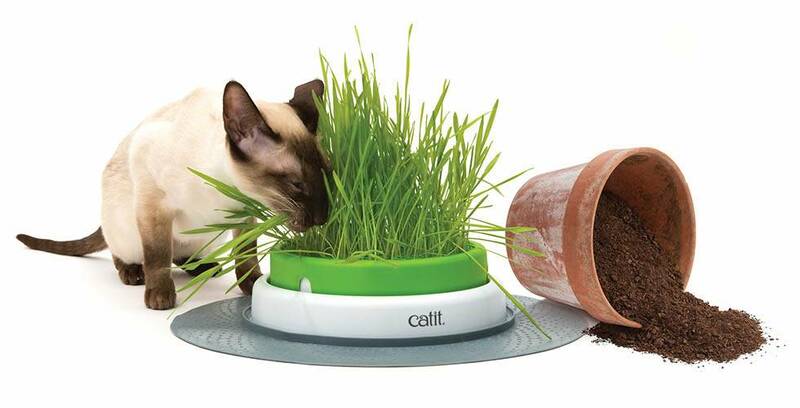 A sturdy planter and some seeds are ideal to grow your own renewable fibre feast for your frisky feline. Get those kitties muchin’ with our popular and easy to use cat grass planter and cat grass seeds. As long as your cat grass has no pesticides or fertilisers present it should be safe for kitty to eat. Make sure your houseplants or any vegetation your cat has access to is of the non-toxic variety, as kitty may decide to have a nip on any greenery that is available. Learn more about cat safe gardens and houseplants with our guides to plants your cat will love and plants that are toxic to cats here.